Last week a question came to me from one of my readers asking for some ideas for decorating bedroom dressers. A couple of days later another reader asked me if I would consider writing about my thoughts on TV’s in the bedroom. Decades ago buying furniture for a bedroom was pretty straight forward. Often we made do with a mix of family pieces or our childhood bedroom furniture until we could afford to purchase a bedroom set or suite. 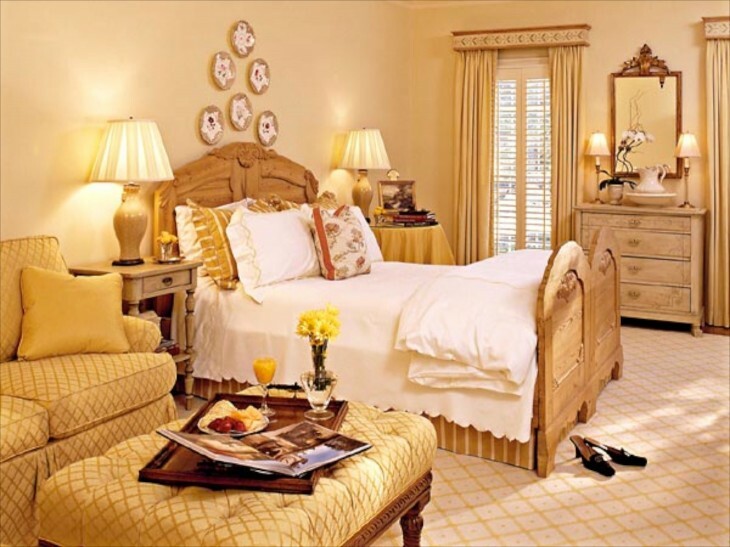 Then it slowly started to change from buying a completely matched set to mixing pieces, adding a sentimental, perhaps inherited piece, or changing out the bed to the popular fabric headboards, and retaining the other pieces, either in the room or re-purposing them in another room. The reason for re-purposing certain pieces? The flat screen TV. Although many people exclude a TV from the bedroom, even when we had only the old style TV’s, many still used the TV before bedtime. The increase in TV’s in bedroom were reflected by the increasing availability of the armoire. 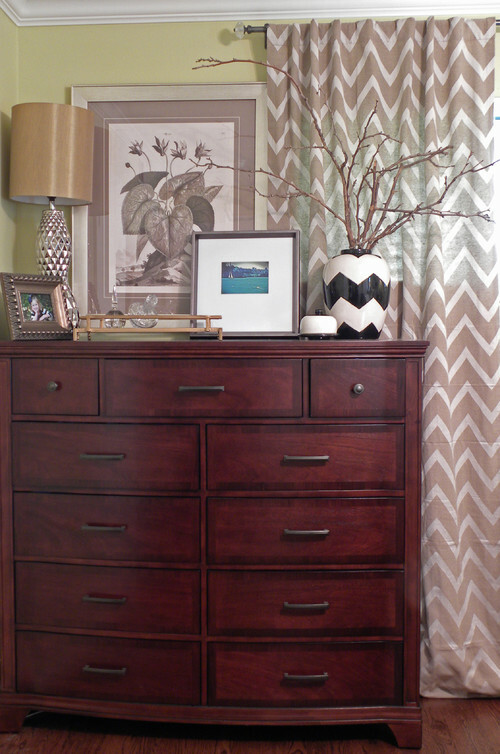 We saw the armoire replace the dresser in many cases, as it offered generous storage and got the TV off the dresser. With the advent of the flat screen TV, many have opted for a large TV in the bedroom, and because of their size they are often mounted on the wall, and sometimes, but much less frequently, the TV sits on the dresser. When I was researching for this article, I cannot tell you how many, probably the clear majority, had TV’s in the bedroom. Why the change? Many newer homes have much larger closets and storage spaces. When you think about it, dressers and bureaus really do not hold very much clothes wise anyways. A walk in closet or dressing room can hold just about all your clothes and linens without a need for a large dresser or two, and the access is much more user friendly. 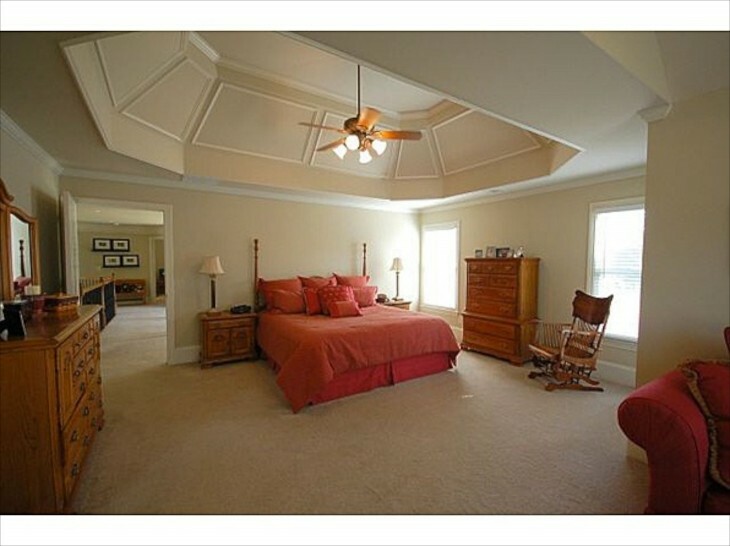 The other change is that bedrooms are bigger and especially without the dresser, can also handle a chair or two. King sized beds allow for the kids or pets to enjoy the room, and the bedroom has often become the favorite place to cozy up with a good read or to watch a favorite TV show….the late night family room if you will. In fact in some homes, especially with a second floor master, we sometimes see a beverage or coffee/snack built in in a corner. Bedrooms have become a refuge as much as simply a place to sleep. 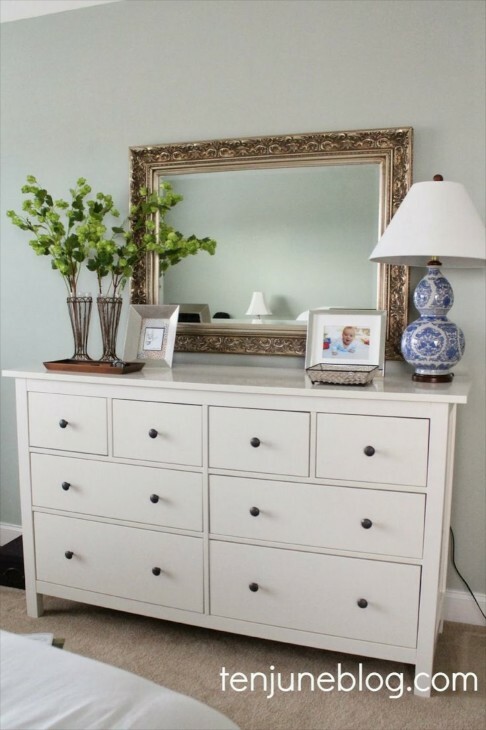 It is important for me to repurpose if possible and if the client is open to it, I have often taken smaller dressers to use as night stands, and below there are some examples. This gives more space for a lamp, books, water and whatever decor you may like. Bedrooms are the one place that you should have items that really matter to you….and because it is not a “public” area in the sense that living and kitchen areas are, you can truly personalize it. 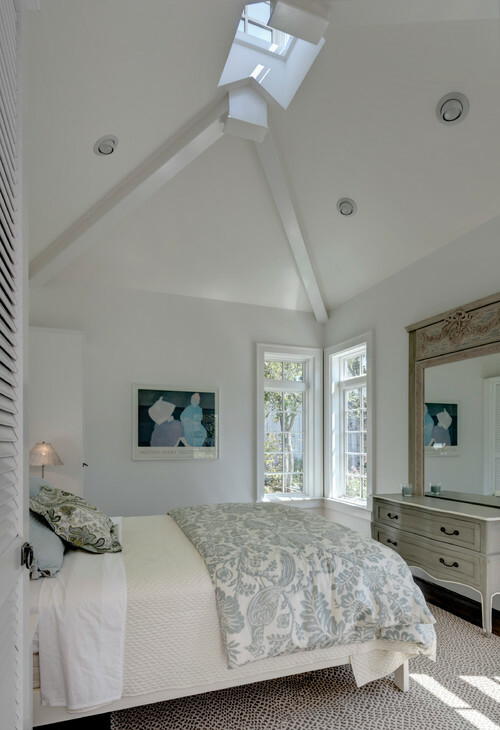 I realize some bedrooms, if the door is open may be visible from a foyer or hall, so that has to be considered in terms of how it fits into the rest of the homes decor. This was how we generally did bedrooms…..every piece was the same wood and was usually purchased together. Matched sets are still available, but it is no longer the only way to decorate a bedroom. 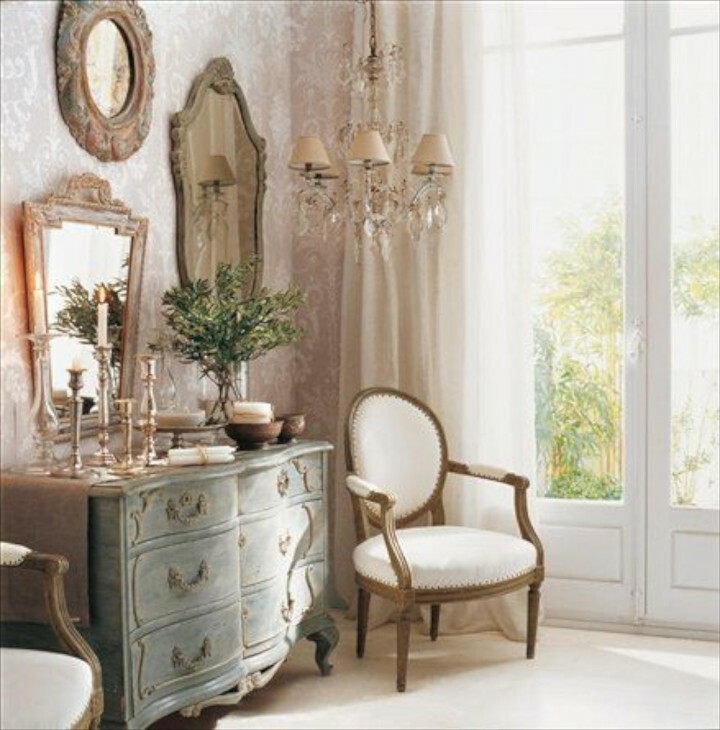 This room is one I would love to design! 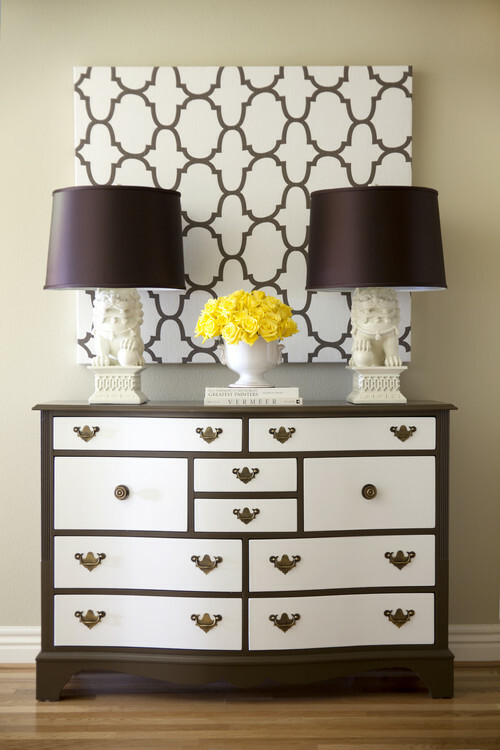 Although some of the photos are of nightstands, the same design elements can be used for larger dressers. Often we now see a round table at bedside, and I like them, particularly in a guest room where you usually only need one nightstand. Notice how the headboard stretches all the way across from bed to behind the table. I love using mirrors behind night stands. They reflect additional light, are elegant and sometimes add visual weight when there is a large bed or headboard, such as we see here. In this case, if there is a dresser across from the end of the bed, I would probably not use another mirror. That is not always the case however. The designer made an interesting design choice when choosing not only two identical table lamps, but two swivel lamps for reading in bed. 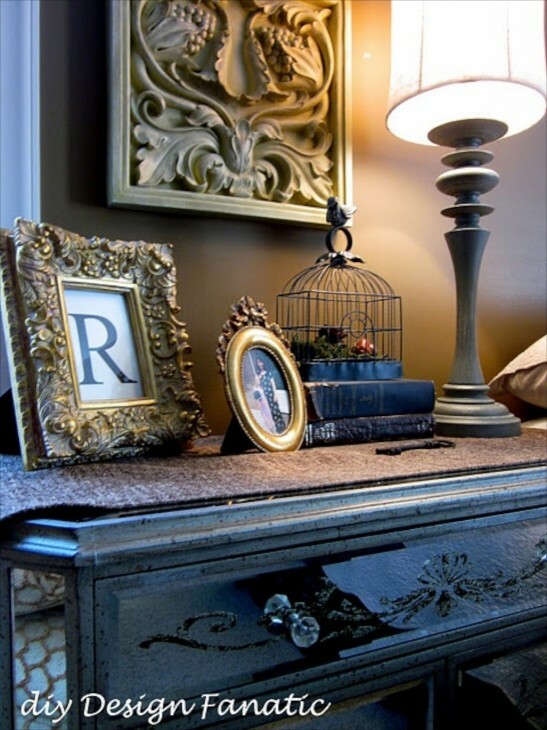 Flowers, photos and a single piece of pottery or art finishes this nicely. Here we see a round table and a smaller night stand. 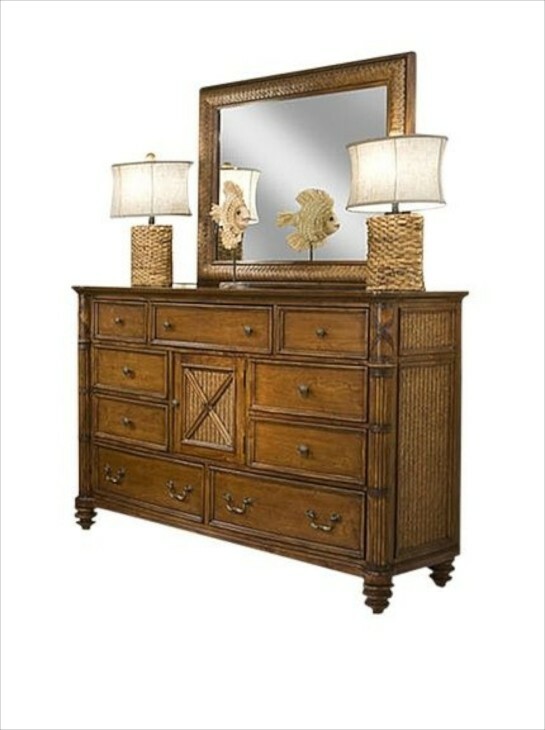 A smaller dresser is placed on the side and decorated with two identical buffet style lamps and two decorative items. This room utilizes symmetry. A sitting area is a welcome addition if there is space. Although this bedroom is small by comparison, it still manages to tuck in 2 petite bed side tables and a chair. Again, flowers, a even one book adds character. 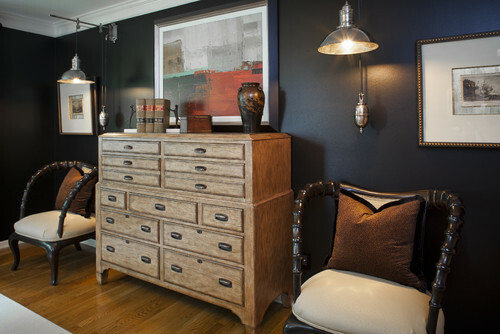 Although there is a small table on the left, and a dresser that doubles as a desk, the lamps are identical. I often used different lamps when I design, but whether or not I do depends on whether the bed tables are the same or not. Here the lamps unify the design. This is the easiest to accomplish, but having impact. Tow identical lamps on the end, with a sculpture in the center of the mirror. Especially effective where the furniture woods all match, including that of the mirror. 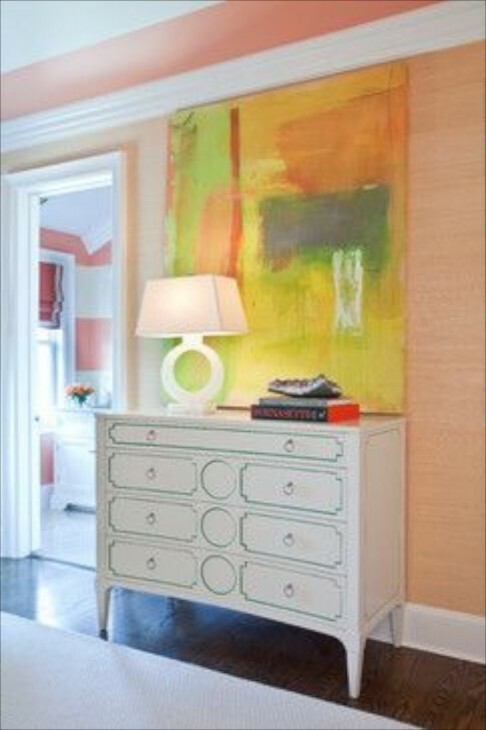 A large work of art can be especially nice, like over this contemporary dresser. The red sculpture and the flowers pick up the bit of red in the art so with just a few well chosen items, a large impact. 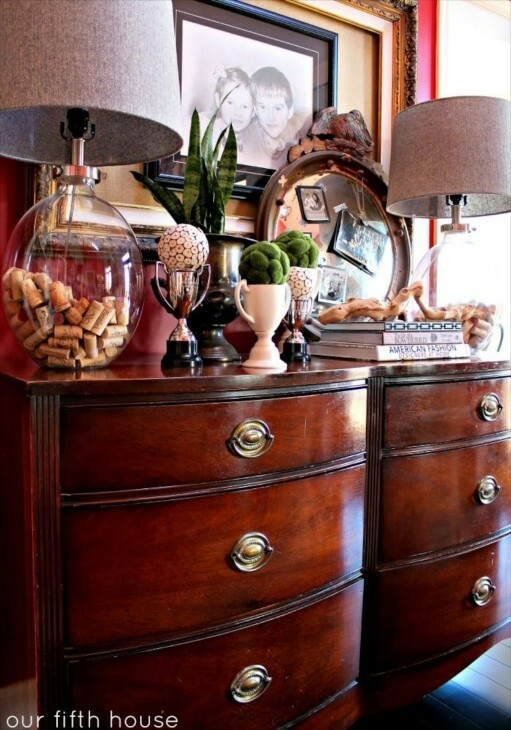 When you have a long dresser I really like a round mirror. It adds wonderful interest, especially when the trim is also shiny. Because there is a floor lamp, just a few smaller objects to each side of the mirror is all it takes. 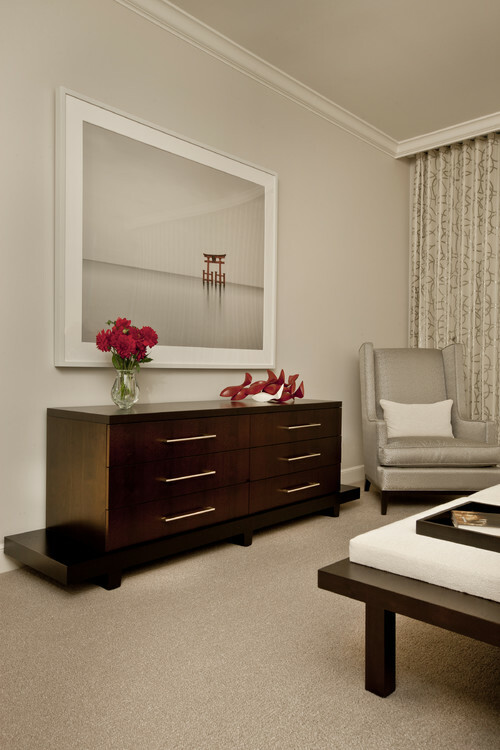 Contemporary Bedroom by Washington Interior Designers & Decorators Sroka Design, Inc. 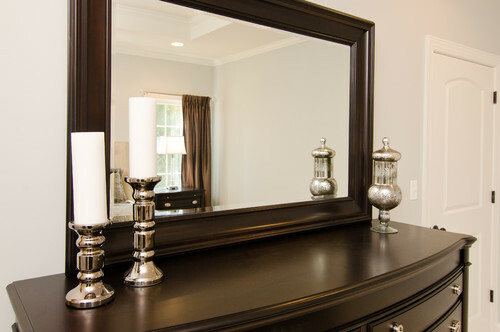 If you have a smaller mirror, it can still be used over a larger dresser if it is balance with something on the side…..either two tall lamps, or candlesticks. Here they used two wall sconces and two tall flower vases with other added objects to create a beautiful look. The crystal candlesticks in the foreground really make a statement and give a finished look. 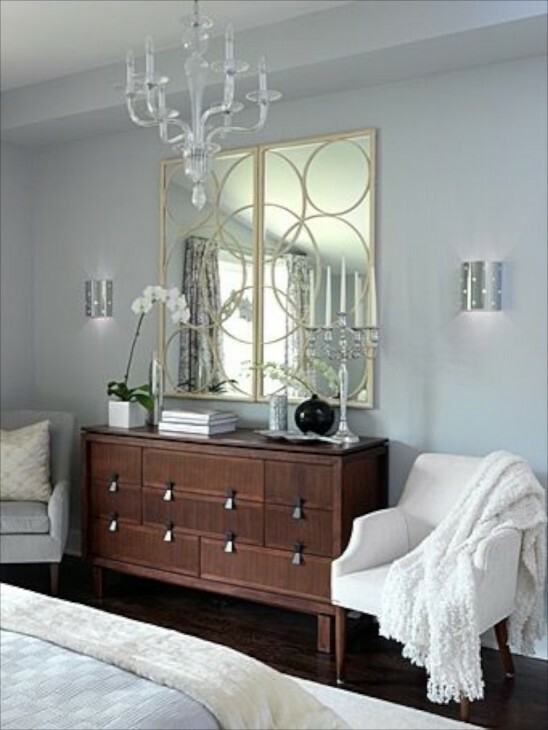 I love how the circles in the mirror are repeated in the punched out circles in the wall sconces. 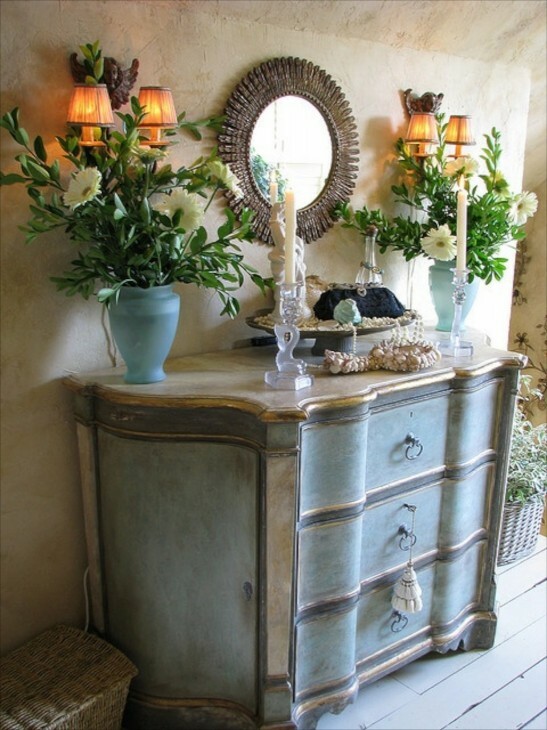 The silver on the walls has increased impact because of the silver on the dresser hardware, and the beautiful silver candlestick. 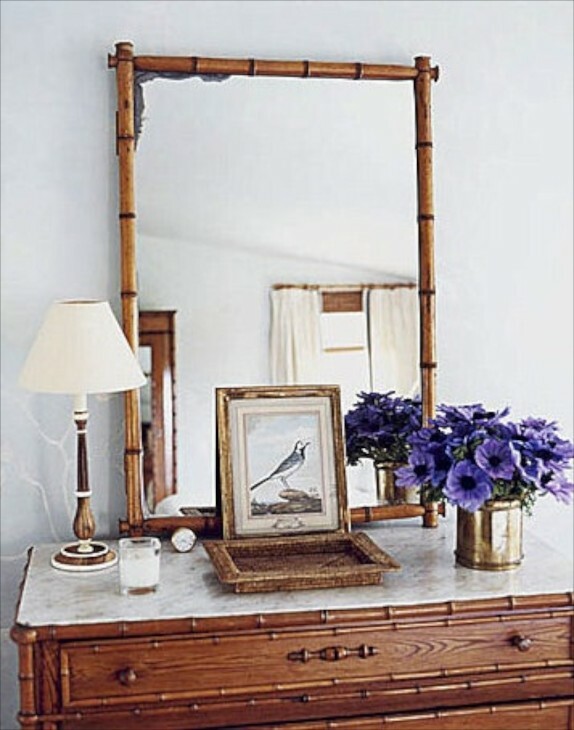 This is a wonderful way to utilize several small mirrors. Although this is a traditional setting, you could do the same thing in a contemporary setting as well. In this vignette they again used silver candlesticks, and greenery instead of flowers. Consider using branches, or bamboo, or a bunch of wheat or other natural grasses as well as flowers when designing the top of your dresser. Leaning art or even another mirror against a tall one breaks up a large space without having to do anything more. Or add some flowers and a tray like they did here. This is a beautifully curated vignette. 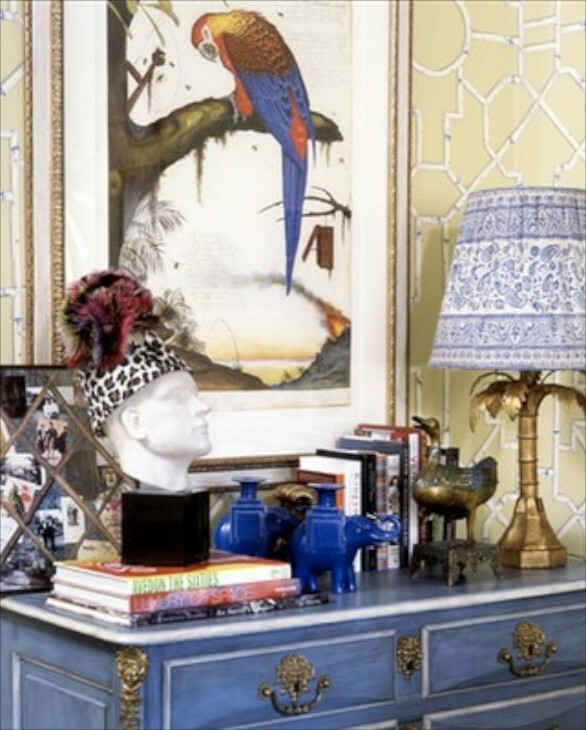 The blue parrot to the blue elephants to the blue lamp shaw to blue dresser provides for a vignette that lets the eye move leisurely to take it all in. The leopard patterned hat on the bust is primo! With a self framed mirror, the tall see thru glass lamp base is lovely. The grouping of pottery and flowers on the other side completes a simple but sweet look. I like pacing something tall next to a dresser if there is enough space. Here it provide texture as well. This vintage dresser is finished with odds and ends. The green fern pulls it all together. I love using empty frames in all sorts of ways. Here they overlaid a couple of unframed bird prints. This would not be balanced without the heavier framed mirror on the left. 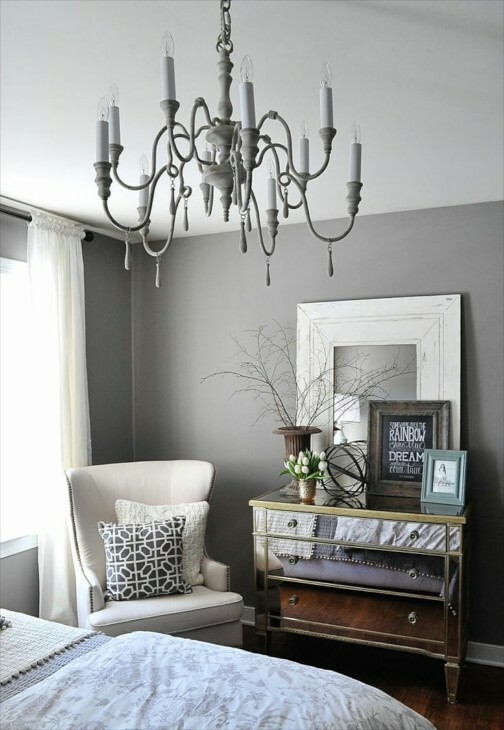 Hang your mirror vertically and surround it with art for a polished look. 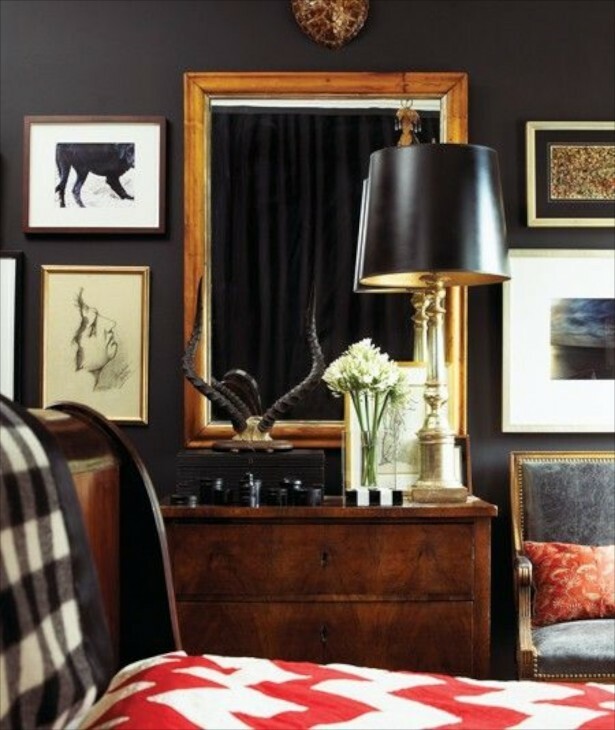 This room has a masculine flair, and I love it. Favorite objects will always work. Place some in the background and some in the foreground, not all in a row. 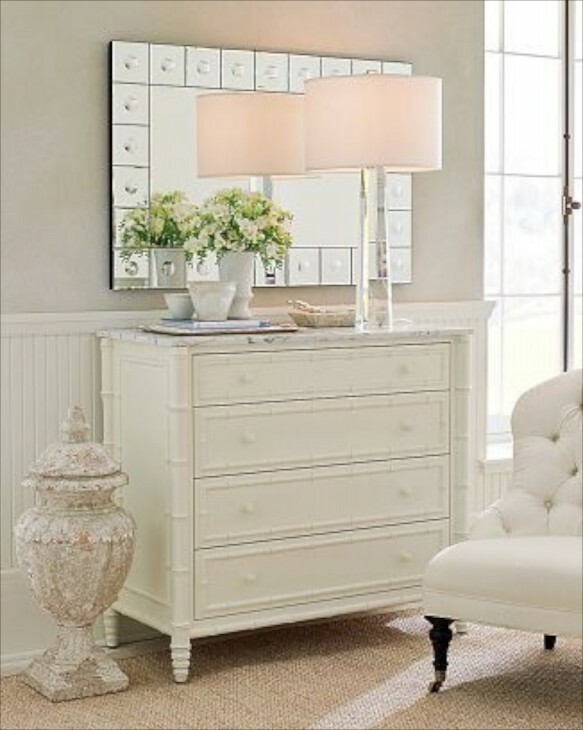 I like the clean look of this vignette and items, because the dresser is essentially sleek in design. I think I might have hung the mirror just a wee bit higher, however. 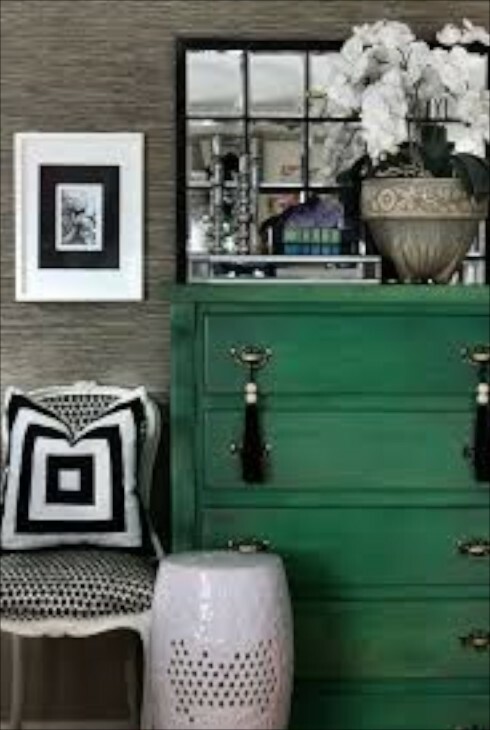 The black mirror is a terrific choice for this green dresser. The heavier flower container is a great choice. Don’t be afraid to use outdoor type containers in the bedroom. They add weight and texture. 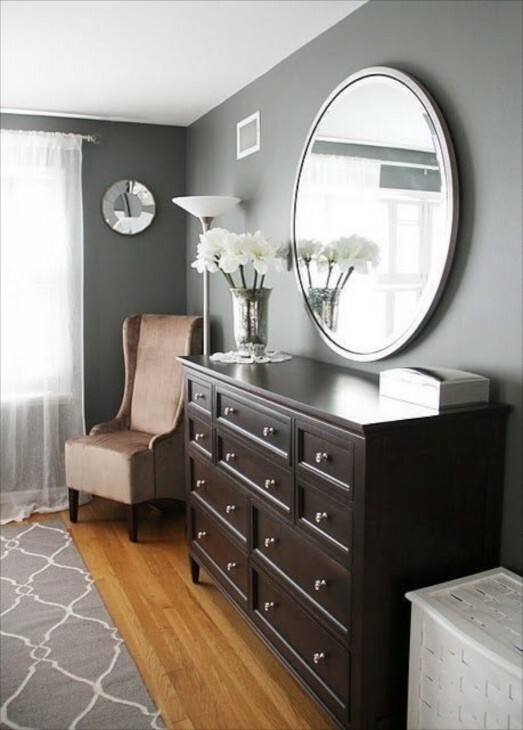 This round mirror looks so graceful on the gray walls and floating over the dresser. 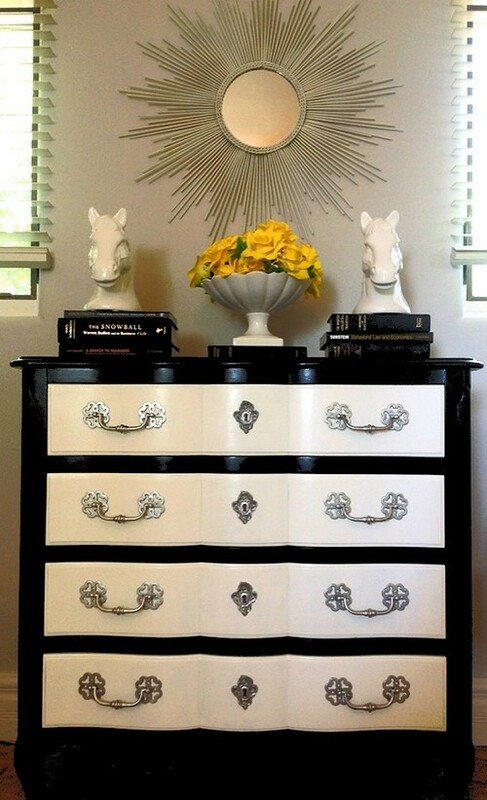 Two silver and mercury glass accents is all the dresser needed. Layers, remember layers. Background, foreground and some in the middle sometimes. This is lovely. I really like art, especially a single large piece above a dresser. In this case, the art stands by itself and doesn’t need anything more save the lamp. And yes, a TV in the bedroom. The black of the screen can really come off as a framed piece of art….think modern art! Books with flowers or a ceramic or a candlestick placed on top of books always looks nice. In the end, there are many variables to consider……window placement, how much decor you want in the bedroom, will there be a TV or not, and how much a minimalist you are. 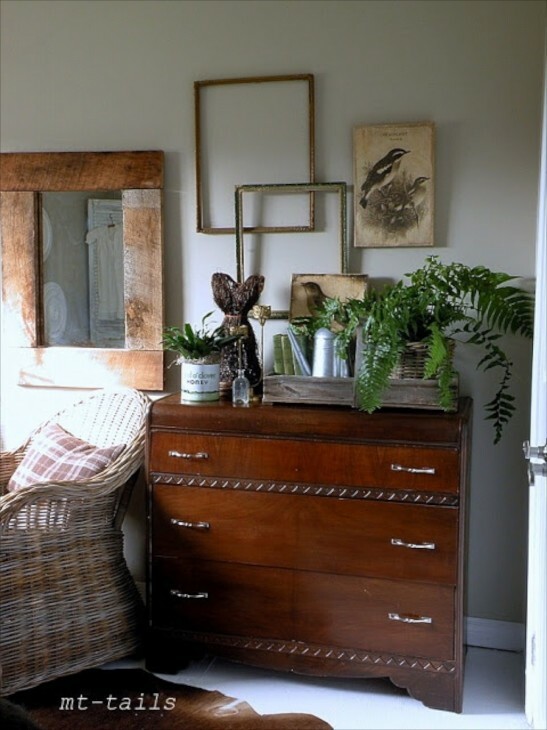 The keys to a dresser vignette is balance and, or symmetry, and layers. Mix it up once in a while. Design should not be static…..move things around or change things out every once in a while. 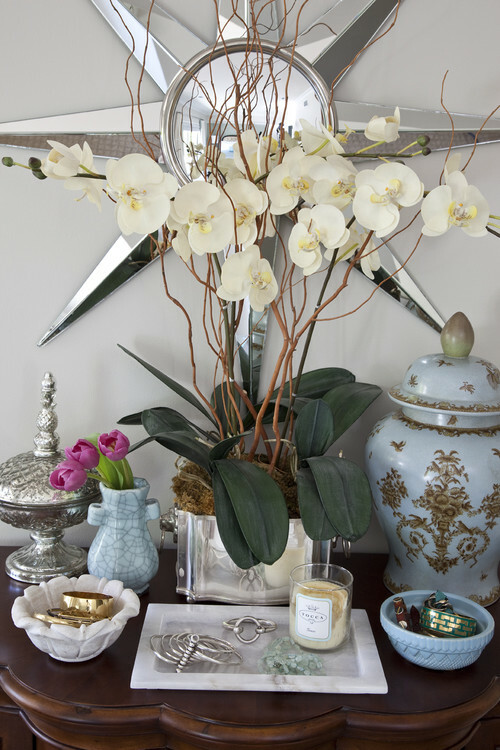 When putting a vignette together for the first time, play with it….you will know if it is balanced or not. And perhaps, think about not doing it all at once. 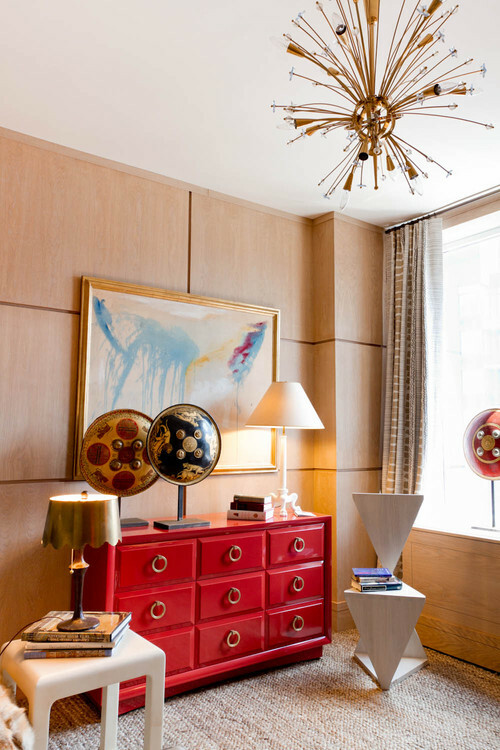 Start with say lamps, and begin to add and subtract until you stand back and say to yourself Ahhhh, looks great! As a designer, I have been asked to design bedrooms to allow for TV’s despite the data that shows it to not always be a good thing. However, like all things, if used judiciously, it doesn’t matter what room it is in. Many designers I have spoken with about this design dilemma hate designing any room around a TV, but todays TV’s are more than simple a viewing screen….many now have technology that allows them to be used with the computer, as security systems, and a whole lot more. That is not going to change, so as designers we need to get creative about enhancing (or minimizing) it’s presence in the rooms we design. If you would like to see a post on TV’s in the bedroom, let me know or if you have any questions about this post or need more ideas let me know. I have a very long dresser with a matching mirror in my master. No way my husband will let me take that mirror down so art doesn’t seem possible. All I’ve done is placed pictures of my family on it in pretty frames, but I really want something different. Since I have pictures of my family in other areas of my house, I wanted my dresser to be something different. My life revolves around my family, which I love, but I just want something that’s an expression of me….flowers, pretty girly things. Any ideas on what to do with this dresser? It’s boring boring boring. You have so many beautiful & interesting ideas, I’d love to hear your thoughts. then wall art isn’t centered??Hmpf! IF the lamp is quite tall, then setting the wall art slightly off to the side would look best. If the lamp is small, then center the art. You did not mention the size nor number of art pieces, but generally, this works. Thanks for stopping by. Please show some posts of tvs on dressers. My son is moving back home, has a flat screen tv that would like to put in a bedroom for him, but only soCe is to place on the dresser. Thank you. I love this post. If I can ask your opinion on what size mirror or type to place over my dresser. I have a light dated dresser but sprayed the knobs a dark bronze color and recently purchased a wrought iron canopy dark brown bed. I am trying to update my space without spending a lot. The width of dresser is 60″ & then there is a small piece to the dresser which is 50″ wide. I have valuated ceilings so I was kind of wanting to be dramatic by placing a tall mirror around 50″ to 60″ high and the width is around 40″. I just don’t know if that would look bad or should I go with a smaller size mirror. Hi do you recall how far from the floor that flat screen tv is hung??? Loved your pictures and comments. Now all I have to do is talk my husband into going along!! This has been a huge help to me. I have been struggling with ideas for my master and now, finally, have a direction to go in. I do not have matching pieces of furniture but after seeing this, can picture how I want the room to look. One question, finding round tablecloths that will hang to the ground has been a challenge. My tables are high, to correspond with my high bed. As always, a wonderful blog! Thank you. Super that you found some inspiration. Finding a table cloth for the higher table….you might think about finding one you like and adding a wide band of fabric at the bottom. Also if you can handle straight stitch sewing, you can make one. Also check out http://www.ballarddesigns.com/ProductSearch2#w=tablecloth . They have wonderful fabric choices, reasonable prices and quality products. You put so much time and effort into each post. I enjoy reading and learning more about design every time you post. Thank you! Thank you Judy. I really appreciate hearing from my blog readers. As a newbie,sometimes it can feel as if you are out there all alone, not sure if what you are posting has value for your readers, so I really appreciate that you took time to comment. I enjoy the research and writing despite the sometimes techie challenges….like having completed a post and watching it disappear! Fortunately I do have excellent tech support, but it still freaks me out! I hope you have a terrific week. That was a lovely and varied overview of dresser design. This is one that I will save to my inbox. I love the symmetry of two lamps in front of a big (not matching mirror). But, I also like the idea of a nice piece of art with the mirrors behind the night tables. Food for thought, for sure. Hi Joanne, I am so glad you found some inspiration. I hope you have fun deciding which direction to go. Thanks again for reading. Thanks! I needed that inspiration this morning! 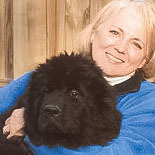 Hi Marsha, I am happy I was able to provide some Sunday morning inspiration for you! Enjoy the day, and thanks for commenting!